We geeks of course carry around USB flash drives because you never know when you need your data or when you need to take someone data. 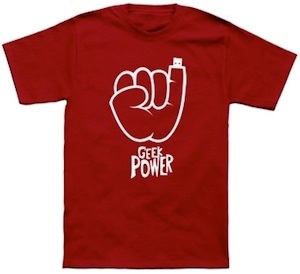 On this t-shirt you can see a fist and below the hand it says “Geek Power” but if you look closer to the hand then you can see that the fingertip is missing of one finger. And yes that was replaced with a USB connector. Does this mean that the finger has a flash drive build in? or maybe that’s how you can make a memory dump of you whole body. Either way this geeky t-shirt is red and comes in a men and women’s version in a wide selection of sizes. Lets show the world how it’s done with this Geek Power T-Shirt.